The 14th CII-EXIM Bank Conclave on India-Africa Project Partnerships concluded in New Delhi on Tuesday. The three-day conclave was organised by the Ministry of Commerce inassociation with Confederation of Indian Industry and EXIM Bank of India. The conclave held annually, since its inception in 2005, brings senior Ministers, policy makers, officials, business leaders, bankers, technologists, start-up entrepreneurs and other professionals from India and Africa on a common platform. Addressing the valedictory session, Commerce Secretary, AnupWadhawan said that trade ties with African countries have strengthened over the years and the relationship has been mutually beneficial. He said this conclave marks the pre-eminence of India-Africa partnership in the realm of South - South Cooperation at a time when the global economy is faced with intractable challenges that stem from rising protectionism and trade conflicts. 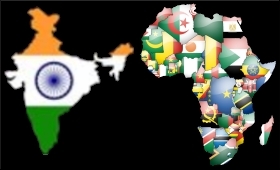 The India-Africa bilateral partnershipisfurther augmented by India’s ascendency as the growing major economy, as well as Africa’s new economic dynamism illustrated by some of the sub-Saharan economies featuring among the top 10 fastest growing economies in the world. The Commerce Secretary said that the conclave coheres into the Indian government’s larger vision of long–term engagement with Africa and Government of India’s unwavering commitment to expanding the canvas of India – Africa economic partnership. He said several Indian engineering companies have been engaged in bridging the gaps in physical infrastructure in Africa by way of development of roads, highways, ports, power generation and distribution and watershed projects that connected different African countries. AnupWadhawan informed that as part of India’s outreach in Africa, Ministry of External Affairs, on 10th September 2018 signed an agreement with the Telecommunications Consultants India Limited (TCIL) to establish a pan- Africa e-Arogya Bharti Network Project. The event also marks the deepening of India-Africa economic and business ties and paves the way for a whole range of cross-border project partnerships.